I met Adolph Caso the first time at the International Book Show in New York City and he struck me as a person who loves books more than anything in the world. Only later on I discovered his interests were not only in publishing but also in writing, translating, teaching and standing up for the Italian American community. In this period of confusion in which some people attempt to rewrite history to please a few, regardless of the accuracy of the rewriting, having a scholar of the level of Adolph Caso on the right side of the case is optimal and I felt that our readers would be happy to find out more about him. Here follows, then, a brief interview that will introduce Mr. Caso. There are link you can follow to discover more about his many activities. Tiziano Thomas Dossena: You are a respected editor, but also a prolific writer and educator on your own. Which profession do you identify the most with? Tiziano Thomas Dossena: You wrote more than one article regarding the “Columbus statue” issue. Do you confirm your belief that this attempted rewriting of history is actually a not-too-veiled act of discrimination toward Italian Americans in general? What do you think we as a community should do to counteract this offensive on Columbus? 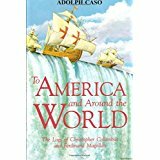 Adolph Caso: Columbus was not a Spaniard, nor Portuguese, and not a Jew. He was from Genoa. Next to Jesus, Columbus did more for mankind than anyone on discovering a route that led to the Americas. Millions and millions of people have derived benefits as a result of Columbus, and not from any other individual, including his ignorant and empty-headed critics. Tiziano Thomas Dossena: Regarding Columbus, you published TO AMERICA AND AROUND THE WORLD–The Logs of Colum­bus and Magellan. Do you feel people who make wild accusations about Columbus should definitely read this book and why? Adolph Caso: The rationale behind this publication was to place before the readers the very words of Columbus himself and not the prejudicial opinions of prejudiced critics. Example, Columbus never dealt with nor captured people to turn them into slaves, as evidenced in his writings. 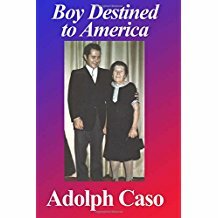 Tiziano Thomas Dossena: Your autobiographical book “Boy Destined to America” was actually written in 1966 and it has just been published. Could you tell us the story behind this book? Adolph Caso: My writing professor told us to write a book about ourselves rather than about others because we know who we are. So, during the summer of 1966, I wrote my autobiography and placed the manuscript on the shelf. By chance, a couple of years ago, I re-discovered it, and the rest is history. Tiziano Thomas Dossena: You also wrote THE KàSO ENGLISH TO ITALIAN DICTIONARY. What is this book about? 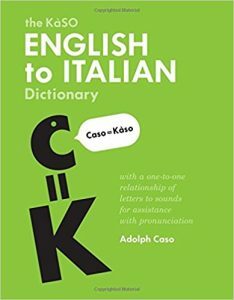 Adolph Caso: Yes, the title is, The Kaso English to Italian Phonemic Dictionary. 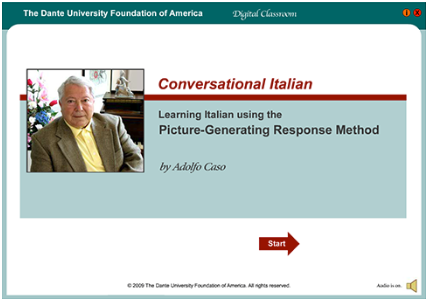 My goal was to show that Italian is based on a phoneme system because it uses the one-to-one principle between symbols and sounds, thus making Italian a system whose phonology is the most scientific, and very adaptable to our computer age. Tiziano Thomas Dossena: Dante University offers online many free courses taught by you and other professors. What are they and how can you take them? Tiziano Thomas Dossena: Were you the founder of Dante University Press? (Please say when it was born and other info, such as its relationship to Branden, etc…) What was the goal you tried to achieve? Adolph Caso: The hope was to establish a press that would allow individuals better opportunities to publish their works about the Italian American experience. Except for a few publications, nothing more came out of it. The community never supported it. Tiziano Thomas Dossena: You also published THE KASO VERB CONJUGATION SYSTEM and BILINGUAL TWO LANGUAGE ASSESSMENT BATTERY OF TESTS, showing a strong interest in bilingual education. Were you a teacher or is this interest only tied to your deep knowledge of the Italian language? 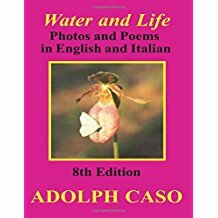 Adolph Caso: My goal was to show the greatness of the language’s phonology I invested time and money in writing and in publishing the book that no one bought. Adolph Caso: Typically, I never stop working, my latest being, Amalfi-Re-Visited, which has failed to sell in any significant way.